“The oceans deserve our respect and care, but you have to know something before you can care about it” (Sylvia Earle)… How about we start learning & caring right now? To observe when snorkeling, diving or swimming! Coral reef ecosystems are among the most biologically diverse and economically valuable ecosystems on Earth. Worldwide coral reefs now attract millions of tourists annually. Respecting the habitat and the welfare of the wildlife is the number one ethical rule for anyone enjoying reef tourism. It is easy to get caught up in a moment of excitement or ignorance and forget to behave mindfully. 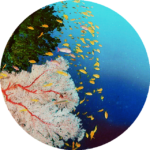 Here, we are getting into further details and highlight special considerations and requirements when you dive, snorkel or swim in these beautiful yet very fragile habitats. Luckily, a little reef etiquette goes a long way in preventing damage to these amazing places. Keep in mind that the general EwA Wildness Etiquette also applies to ‘Reefing’. Coral reefs, along with seagrass beds, mangrove habitats and other tropical marine environments, support the highest marine biodiversity in the world (25%) [PL11]. More than 500 million people worldwide depend on them for food, storm protection, jobs, and recreation. Their resources and services are worth an estimated 375 billion dollars each year, yet they cover less than 1% of the Earth's surface. Knowing is Caring: Learn before you go. Visit reefs well prepared so as to minimize your impact, and maximize safety for anyone (and wildlife included) as well as for the pleasure of everyone. Enjoy! Don’t snorkel alone. Don’t dive in too large groups either. You’d never go mountaineering or outback packing alone. The same generally applies with diving or snorkeling. A reef is usually a complex ecosystem with areas unevenly safe. So it’s always better to be more than one, but one does not want to overcrowd either for multiple reasons including safety and preserving the health of the reef. ▸ The optimal size of a group depends on a variety of factors including the size and the structure of the area, the experience of the people in the water, the restrictions in place locally, the presence of guides. So make sure to ask the local organizations both how crowded the area can be (to help your planning and avoid overcrowded sites for your own enjoyment), and what group size they recommend. ▸ Make sure to coordinate/prepare how you will dive/snorkel together. Also make sure the group understands the different expertise or diving proficiency level of each of its members. ▸ Once you are in the water, stay as a group. Move slowly and calmly. Practice good buoyancy. And don’t queue for photographs as repeated flashes can harm wildlife. Protect both yourself and the reef. We want to raise the attention to the kind of chemicals or invasive species that we spread around when we swim: our sunscreen, our gear’s fabric or material, etc. ▸ Always apply only biodegradable reef safe sunscreens. Why? Because it has been found that our chemicals in sunscreen can awaken coral viruses. The coral then becomes sick and expel their life-giving algae. Without these algae, the coral “bleaches” (turns white), and often dies. ▸ While no sunscreen has been proven to be completely ‘reef-friendly’, those with titanium oxide or zinc oxide, which are natural mineral ingredients, have not been found harmful to corals. Sunscreens sold for children or for those with sensitive skin may contain these gentler compounds as the active ingredients. ▸ A safe alternative (which we favor) is to not wear any sunscreen and use a long-sleeved rash guard when swimming. Otherwise, check the Coral Reef Alliance for some recommendations. ▸ If you use sunscreen, apply it 30 minutes before entering the water: This limits that they reach the corals and impact its ability to photosynthesize. ▸ Also make sure your gears do not contain harmful chemical or toxic residues from previous swims, as well as that they have been properly cleaned after the previous usage in another habitat. Be mindful of your position in relation to the reef and wildlife. Learn before you go and check the viewing regulations in place in the area where you plan to dive, snorkel or swim. Regulations differ depending on the situation of the marine wildlife populations in the area, and the laws of the country. ▸ Then maintain those minimal distance requirements. Our recommendation is to try to respect a one-meter distance to the reef (3 feet), and above all be alert of the behavior of the marine life around (e.g., if fish disappear into the reef you’re too close). ▸ Generally, keep a distance of 3 to 5 meters to any marine animal, and more if you are close to the tail of a large animal such as a whale shark. ▸ It is important with some species to always keep a safety distance such as with stingrays, triggerfish, lionfish. And who would think… but stay more than 1 meter away from giant clams. ▸ In short, check what are the species to avoid in the area before you go. ▸ One does not think about the vertical distance to things, but it’s generally recommended to avoid snorkeling, diving, or swimming into reef areas where the water is less than one meter deep (3 feet). It is also important to have good buoyancy, therefore practice before you dive. ▸ Also, make sure that your equipment is well organized and does not touch the reef. ▸ Swim slowly and in parallel to the animal at a distance which does not cause that animal to change its behavior. ▸ Do not hover over a turtle. They need to go to the surface to breathe. ▸ Never be in front of a moving animal. Never restrict the path of a marine mammal or cause it to change direction. ▸ In all cases, don’t harass, chase, overcrowd or disturb resting wildlife. » Check Also: The Greater the Distance, the Better for All! Practice passive interactions and great buoyancy. ▸ We are stronger than we think. Handling wildlife can damage the intricate structures of delicate animals. For instance, leopard sea cucumbers will expel their intestines when handled; this is a defense mechanism, and having to repeatedly do it can damage the animal’s interior structure. ▸ Our skin and gears are harmful/toxic. Our skin is coated with our own set of bacteria, not counting the chemical stuff that we apply on it. Our gears are not any better. The effect is often not immediate, which makes the visitor think that s/he is not directly responsible. For instance, Black-band and brown-band diseases spread easily among coral colonies, and these bacteria may hitch a ride on hands touching the wildlife. ▸ Some diseases can be mutually transmitted as with a case of dolphins. ▸ But they want to play with me! Some fish are playful or plain curious and initiate contact. Then know that many fish excrete a protective layer of mucous over their scales that acts as a buffer to the outside environment, much like human skin. Touching fish, even those that seem to enjoy it, can wipe off this layer and make the animal more susceptible to infections. Maori wrasse, a great large fish of the Great Barrier Reef, are notorious for coming close to divers and many can be seen in selfies hugged by exhilarated visitors. While there is no doubt that it’s fun, this action over time may mean the animal loses its ability to fight infections. This behavior is not natural and is learned through repeated interactions, most usually involving a food reward. ▸ “No Touching” includes ‘no collecting’ of coral, shell or animals (dead or alive). Alive: they don’t survive long, and doing so is depleting the reef or one somewhere else. As for dead corals and shells, they still have a function in the reef and on the shorelines. For instance, shell removal from marine shorelines, have resulted in some areas in multiple habitat changes such as increased beach erosion, changes in calcium carbonate recycling, and declines in diversity and abundance of organisms, which are dependent on shell availability [KM14]. So, give dead corals and shells a chance to fulfill that role fully. Don’t touch also means: not removing or breaking a piece of coral. And wearing gloves does not change the rules. Not touching includes making sure your fins or your gear don’t either. Marine life includes corals. They look like a colorful rock but they are very much alive. Touching them harm or poison the delicate relationship between the algae that live among the coral tissue and the coral itself. The slightest of our touch can damage their polyps. ▸ In shallow waters, when being tired or wanting to take a break from swimming it feels natural to stand to relax. Don’t do it. Simply relax on your back. Or alternatively, tread water. You can tread with your knees bent up close to your bodies to avoid getting in contact with anything. These are really great skills to learn before getting to the reef and they make a real difference and help preserve the reef. ▸ It’s even recommended for snorkelers to wear float coats —inflatable snorkel vests— to allow adjusting gears with ease. ▸ Generally also avoid contact with the ocean bottom. Don’t walk on seagrass and step on sand patches instead. On sand patches, don’t stir that sand. Be mindful of your fins, which extends far beyond your feet. Even without contact, you can kick up sand and sediments, which lands on corals and blocks the sunlight. Areas that appear empty may support new growth if left undisturbed. So as mindful swimmers we should only use the weight needed and practice proper buoyancy control. ▸ About potentially dangerous encounters: To avoid the situation or minimize the risk of such encounters, know where you go and what you are likely to encounter. Simply avoid areas with high risks. 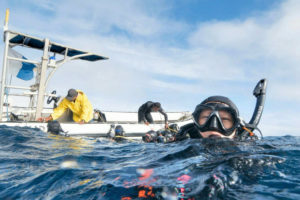 ▸ If you dive with a group, ask the leader(s) what is the retreating protocol before you go, insist on a proper debriefing. ▸ If encountering sharks while diving is more manageable, the same can’t be said when snorkeling or swimming. Do not go swimming or snorkeling in areas where sharks have been observed, even in proximity of reefs. Do not go for a swim at dusk or dawn time in those areas either. In the Red Sea, a few accidents happened to swimmers that went in waters where sharks were known to transit. 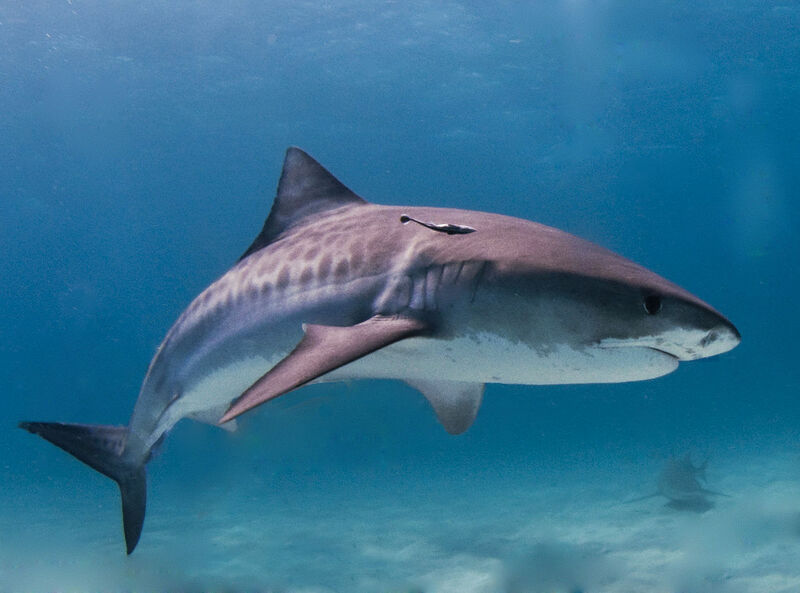  Why is swimming or snorkeling less safe than diving when encountering unsafe sharks? One assumption is that when we snorkel/swim, you are at the surface (similar to surfers) and our shape from below looks like a prey. Sharks tend to attack from bottom up. At dusk or dawn, when the light conditions are low, the confusion with a prey is even higher. When we dive, we are often at the same level as the shark and we are able to circle when they start circling us. We are also more alert. It is possible that we are then less appealing because we look less like a prey. What is dangerous for example, when diving with sharks, is going back up too fast. This will attract the shark attention because you look like a potential prey. ▸ As for the curious sharks: Most shark species that are inquisitive enough for close approaches are found in open water, not along the reef. Staying next to, or retreating to, the reef should help avoid a close encounter. If conditions allow it, surface next to the reef and wait to be picked up. Should I Worry About Shark Attacks? I am going snorkeling and diving. Should I worry about sharks? Worried? It depends. But in all cases, you should be prepared and know your sharks. How Likely Are Shark Attacks? Source: Shark Attack FAQ (Florida Museum). Of all the existing species of sharks, only about a dozen should be considered dangerous when encountered. Don’t feed – Keep them healthy – Keep them wild. Feeding fish should be avoided: it is harmful to wildlife, the marine habitats, and the people. ▸ Hand-feeding wildlife promotes conditioning, habituation and makes wildlife more vulnerable to predators. This also applies to fish as they have memories and can learn. ▸ Wildlife feeding impacts negatively the ecosystem itself. 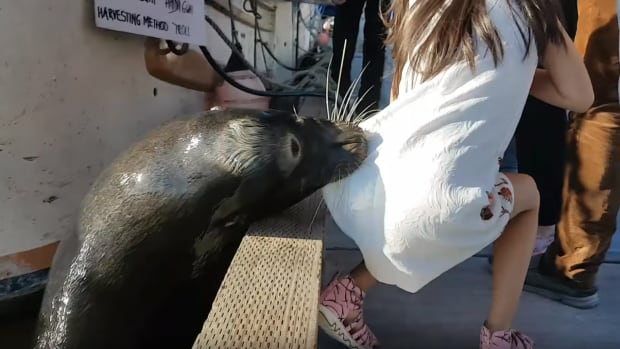 When fish and marine mammals are fed by us, they start anticipating. This directly alters the feeding behavior that the habitat itself relies upon for living. For instance, a lot of the reef fishes are grazers, meaning they only eat algae. They keep the growth of the algae on coral reefs under control so that the reefs aren’t smothered. When regularly introduced to unnatural food like bread, they get overfed and too full to graze on algae. Then the algae overgrow. ▸ The food that we give them does not compare to their natural diet. It can’t even be considered complementary, it is just not suited and most often plain harmful. Feeding wildlife also interferes with its natural and complex feeding cycles (seasonal and others), which again harms both the wildlife and the habitats they live in. There is now ample data showing that human pollution is affecting wildlife in all its forms, and this includes reef fishes and the corals themselves. Also, note that many marine animals function at noise frequencies different from ours. We are loud in nature, and our sounds are amplified under water. Therefore, communicate as minimally and necessary as possible –quietly and efficiently. When too many people are trying to get close to one individual (be it a dugong, a turtle, a dolphin, a shark or a fish species), the animal gets frightened by the noise and the pressure, and usually leaves the area or hides until the situation gets back to normal. In the short term, this disturbance leads to a temporal change of the animal’s natural behavior. It also means that the swimmers won’t have a chance to admire the wildlife. If the harassment persists over time then the animal might move to a different area. Keep this in mind, be mindful of the animal and of your swimming partners. Be mindful: Anchoring overboard may have a significant impact on the world below. 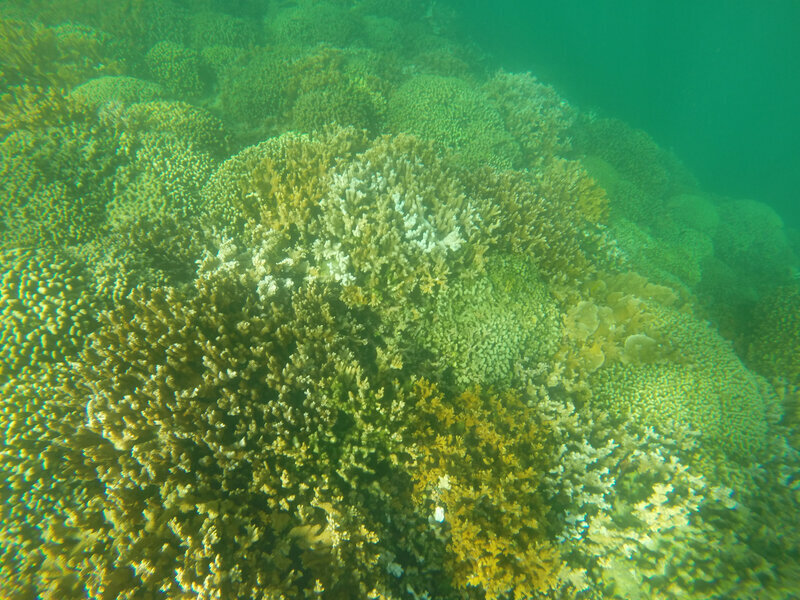 Boat anchors can cause considerable damage to coral reefs, including coral breakage and fragmentation. Larger ship anchors and heavy chains can break or dislodge corals, resulting in damage to vast areas of coral reef. While smaller ships cause less damage, areas of heavy recreational boating may also have serious consequences for coral reefs [WC02]. Anchoring impacts can be alleviated with the installation of mooring buoys in many locations, but anchoring of small vessels on reefs remains a chronic problem over reefs in many developing countries. Anchor damage on coral reefs can persist for many years. For example, anchor damage on a reef in the Virgin Islands resulted in a decrease in live coral cover, compared to coral cover on adjacent undamaged reefs, which remained ten years after the damage occurred [RC01]. Anchoring also damages reef-associated habitats such as seagrasses, which provide important nursery and juvenile habitats for many coral reef species. ▸ Then remember that and use public mooring when you can. ▸ Never anchor directly on coral. ▸ Anchor in sand or mud wherever possible. ▸ Generally, anchor in water deep enough to avoid your vessel grounding with the tide change. Don’t make waves. Leave no trace. Those plastic 6 pack rings are definite killers of wildlife, as any other plastic product and waste are. Take your trash with you and dispose of it properly at home or where you stay | Photo source: 3Ders.org. Litter is a danger to wildlife. Too many turtles, dolphins, and whales die after mistaking floating plastic bags for food and eating them. Too many pelagic and shore birds feed their chicks the wrong ‘stuff’ (plastic), who end up never making it. 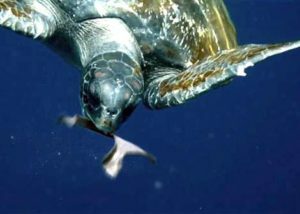 Fish, birds and marine mammals often become entangled in fishing debris. Litter and debris on nesting beaches can interfere with a turtle’s ability to scoop out an egg chamber and deposit eggs and may even prevent hatchlings from reaching the sea. ▸ Don’t throw. We can’t emphasize this enough: don’t throw anything in the water. Don’t leave trash on the beach as anything left on a beach ends up in the ocean. Dispose of your waste properly instead, and recycle when it is recyclable. Pay attention to not overfill bins, just find another bin and make sure lids are securely fastened so that the waste does not fly off. The best choice is to simply take your trash with you and dispose of it properly at home or where you stay. ▸ Give a hand. The help of all of us is needed to alleviate our human litter issue. Lend a hand yourself with trash: You see plastic floating or waste on the beach? Take it out and avoid having that piece of garbage becoming part of the ginormous marine debris problem. Eight million tons of plastic end up in our oceans every year. What it’s done to this island is a stark warning. We only know what we know…. And it’s easy to forget the rules in the moment, while in awe. Let’s accept that, be humble and keep ourselves in check. It’s easy to not behave mindfully. Out of ignorance, it is even easier to not know that we might have a negative impact. Let’s be aware that in a moment of excitement (no matter how well intended we are), ourselves we could forget those rules. Let’s be humble and keep ourselves in check. When you witness ‘code-breaking’ by either visitors, guides or experts, don’t remain silent: Assess the situation and if safe then ask why they’re behaving the way they do. Discuss the known consequences. Those consequences can be lethal for our marine friends. The problem with our silence is that the issue is deepening, and possibly impacting that habitat and its inhabitants directly. Best is to come prepared and discuss the rules with your party group and the guide before getting on the site. In all cases, discuss respectfully with uninformed tourists, guides or experts. And if you feel you can’t (that is, if you feel unsafe, threatened), then report immediately to higher authorities as soon as you’re back in safety. For instance, in the U.S., to report marine mammal violations, such as people feeding, attempting to feed, or harassing marine mammals in the wild, please contact the national NOAA Fisheries Enforcement Hotline: 1-800-853-1964. Information may be left anonymously. If you are planning to visit reefs and the wildlife around, please take the time to also check our general EwA Wildness Etiquette. Help the protection and conservation of the habitats and species you enjoy. Thanks! [GBRMPA] Responsible Reef Practices (Great Barrier Reef Marine Park Authority) — There are Responsible Reef Practices for almost all of the activities on the Reef. It targets Great Barrier Reef, but most applies to reefs in general. These are common sense guidelines to help you in your day-to-day operations. Please take the time to learn how you can do the best you can when operating in the Reef, whatever activity you are undertaking. 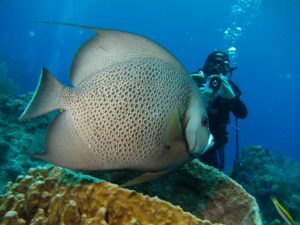 [NOAA] Responsible Marine Wildlife Viewing (NOAA Guidelines) — The site offers a very extensive sets of viewing guidelines covering different marine habitats and marine species. This set of guidelines can be used in other regions in the world for the species in question. Some species migrate, and the rules for instance, for watching a female humpback whale individual will not be radically different depending on if you see her in her nursing habitat down South or in her feeding grounds up North. [AMMPA] Watchable Wildlife Guidelines (The Alliance of Marine Mammal Parks and Aquariums) — Minimal sets of wildlife viewing rules with a focus on marine mammals. [NOAA-2] Viewing Marine Mammals in the Wild: A Workshop to Discuss Responsible Guidelines and Regulations for Minimizing Disturbance (NOAA) — A non exhaustive snapshot of projects and programs on various species around the globe, and some summaries that provide useful references to articles on wildlife viewing. Note that the report is by no means exhaustive. Sharing is Caring Share this etiquette around! ◊ Note that this Etiquette is and will remain a work in progress. If there is anything else you would like to see added, please let us know and we’ll do our best to include it. Let’s be Earthwise Aware. Let’s enjoy and protect wildlife responsibly! Thanks for your support!